Steve Herrmann owns two farms, but doesn't plant a crop or milk a cow. That's because his farms are miniature scale models situated next to each other inside a full-sized trailer he travels the country with. The Eden Prairie man visits schools, fairs, toy and farm shows, conventions and other events, showing his farm models, called "Trailing the Farm." Herrmann will be at the Wright County Fair with his miniature scale models Wednesday evening, July 31; and Thursday evening, Aug. 1; and all day Friday through Sunday, Aug. 2-4, this year. The trailer holds 1,400 pieces of farm equipment, animals and machinery, featuring a farm from the 1960s and one from 2000. The models are based on his memory of growing up in Southwestern Minnesota, and feature replicas of such items as a grain elevator in Avoca, Minn., which is located between Slayton and Worthington. Every kind of equipment and gadget is there, including tiny round and square balers, hay conditioners, field cultivators, and other basic items, such as miniature John Deere and Case International tractors, and skid loaders, among many, many others. Some items are made of wood that he custom cut, such as tiny pig feeders (which were tricky to do, he said), while others, such as the grain bins, are made of plastic. In fact, many people ask him what his secret is to making the items look so real, he said. His log chains are made of necklaces. Manure? Made of coffee grounds. The corn fields are doormats sprayed with paint. The round hay bales are made from steel wool and artificial grass. "Mustard seeds work for soybeans, corn meal for shelled corn, and cereal is used for ground feed," he said. Spices from the kitchen were used for mineral and protein for the animal feed, he said. The most expensive item is a brass handmade corn sheller, which cost $325, he said. It is small enough to hold in the palm of the hand, he said. In addition, five gallons of dirt situated at the farm had to be run through a meat grinder to get the lumps out, he said. Not much of it is glued into place, since the farms are constantly changing, much like a real farm, he said. The replicas took 16 years to build, he said. Herrmann remembers growing up on the farm with great affection, being the fourth oldest of 13 children. His family, with six brothers and six sisters, made a living off of 400 acres of farmland and 200 acres of pasture. Only one younger brother is farming, back in Murray County, where he grew up. He would dearly love to farm himself, if he could afford it, he said. Farming is so expensive nowadays, considering equipment and the cost of land, he said. 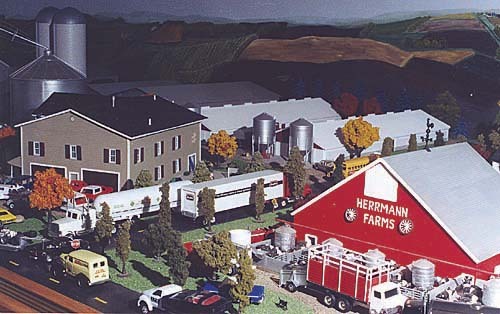 Based on Herrmann's early years, those who enter the trailer will see the 1960 farm model first, which is replicated from his past. Theoretically, the '60s farm model is based on a farm with 60 dairy cattle, 200 beef, and 200 hogs, he said. Toward the end of the trailer is the modern farm, which is very different because of the change in times, he said. The modern farm model has 325 beef cattle with a 2,000 hog finishing unit, four-bedroom house and two-car garage, he said. There is a dealership located in the scale model that can be customized for local dealerships as well, he said. There is a 35-foot long wall mural, painted by friend Pat Brucki of the Twin Cities. It started with the purchase of two toy tractors at a toy show in Mankato, he said. This turned into a tractor collection that is more than 300 now. Originally, the farm was set up on a card table in the living room of his home. It was transferred to a four foot by eight foot plywood in the laundry room, he said. More than a decade later, the farm measured 10 by 12 feet in the garage. When it was time for bed, Herrmann would crank the farm up to the ceiling with a combination of cables, pulleys and a boat winch, so that a car could be parked underneath, he said. In 1999, the farm moved from the garage to a 24- by eight-foot trailer, and the layout was given the name "Trailing the Farm." Today, Herrmann spends time travelling the country with his scale models. He has exhibited his scale models at 22 county fairs, including the largest fair in the country at Spencer, Iowa, as well as the Minnesota State Fair in 2000. In fact, he just received a call from the Nebraska State Fair, he said. "Some people go through the trailer four times," Herrmann said. "And some kids say it's better than the rides," he commented. Farmers will talk for hours about one particular piece that jogs their memories about something, he said.